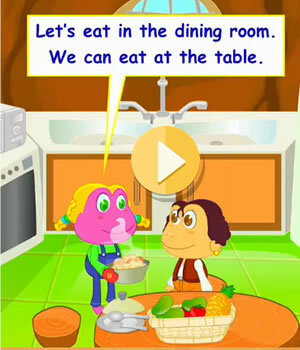 Teach ESL/EFL young learners how to talk about things in a house. 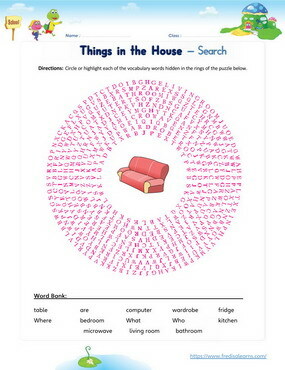 Build vocabulary by associating rooms in a house to related household items. Learn to use ‘There is’ and ‘There are’ when referring to objects in the singular and plural. Learn to use different questions words (what, who, where) to ask about things, people and location of things. Reinforce the use of the verb ‘to be’ in the 3rd person singular and 3rd person plural when talking about objects in this English lesson. The worksheets below are useful for offline and classroom activities. 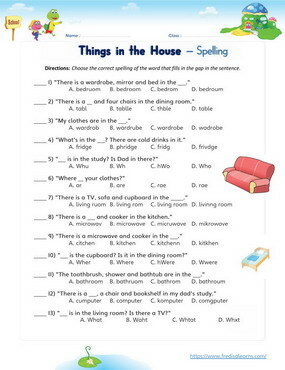 These printable exercises directly correlate with the above lesson 'Things in the House'. Every worksheet comes with an answer sheet on the second page for educators. Lisa’s friend, Jane, has come over for a visit. To make her feel at home, Lisa is giving her a tour of the house and showing her where different things are kept. She starts with the living room and later all the other rooms. Jane likes Lisa’s home a lot. 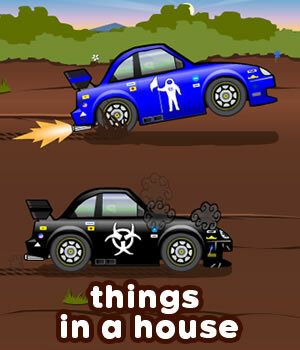 What’s in the living room? There is a TV in the living room. What’s in the dining room? There are chairs in the dining room. There are utensils in the kitchen. What’s on the study room table? Dad is in the study. Where is…? / Where are…? It’s in the living room. There is a microwave in the kitchen. There are four chairs in the dining room. There are books on the bookshelf. Lisa: Jane, this is our living room. Jane: I like your living room. What do you do in here? Lisa: I like to sit on the sofa and watch TV. Jane: Does everyone fit on the sofa? Lisa: No. Sometimes we have to sit on the rug, or in a chair to watch TV together. Lisa: This is our kitchen, Jane. Are you hungry? Jane: What are you doing, Lisa? Lisa: I am looking in the fridge for a snack. Jane: Did you find anything? Lisa: We can heat these in the microwave, or in the cooker. Jane: Let’s use the microwave. It’s faster. Lisa: I am looking in the cupboards for utensils to eat with. Jane: Where should we eat, Lisa? Lisa: Let’s eat in the dining room. We can eat at the table. Lisa: Do you want to see my bedroom? Lisa: This is my bedroom. That is my bed. Jane: I like your bed. Where are all your clothes? Lisa: They are in my wardrobe. Lisa: This is the bathroom. Oh, our toilet paper roll is empty. I should change it. Jane: Oh no! I forgot my toothbrush. Lisa: Here, I have extras. I have toothpaste too. Lisa: This is our study. It’s where Dad works on the computer. Jane: It’s very nice. He has a lot of books on his bookshelf. Lisa: Yes, he likes to read.